Does your back or neck hurt? Are you concerned about your musculoskeletal health? Our Chiropractors specialise in the treatment, prevention and management of conditions caused by complications arising from bones, joints, muscles and nerves. Your first consultation with us will involve investigating your medical history usually followed by a full physical examination. A report of findings, full explanation of the problem and the best approach to care will follow before the first treatment. Take advantage of our special offer now and save yourself £70. This offer is available at both our Sutton Coldfield and Leamington Spa practices and includes your first treatment too! 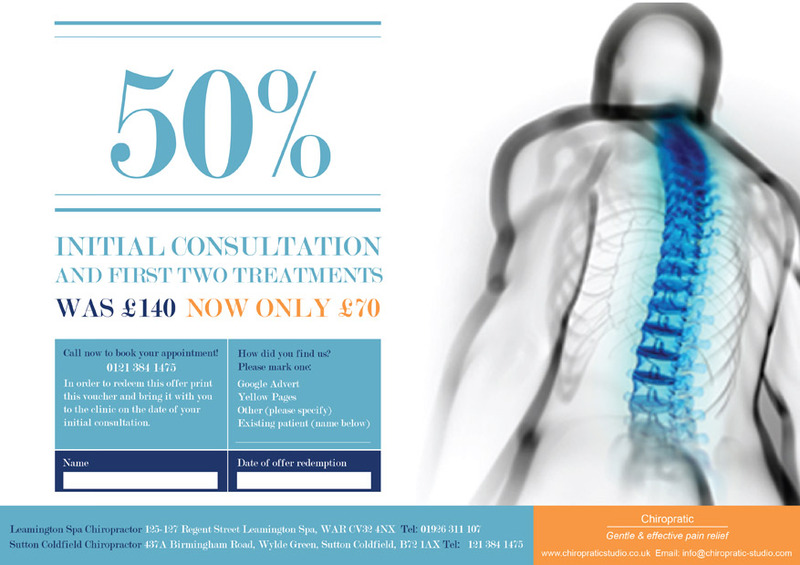 Simply call 0121 384 1475 to book and bring the printed voucher with you to your initial consultation. You can print the voucher by clicking on it to download it. If you have any questions you can speak to a member of our team on 0121 384 1475. We look forward to helping you achieve optimal health and wellness! Call The Chiropractic Studio to set up an appointment today!